In order to ensure greater security and reliability of Windows operating systems such as Windows 7, Windows Vista, Windows Server 2008 and Windows Server 2008 R2, a lot of system files have been assigned and granted ownership and full control permissions to TrustedInstaller and has special restricted permissions to all other users, including administrators. While the design makes accidental deletion or change to system files, it makes job of technical users harder though. Manually take ownership and grant full control permissions of the files (including executables) and folders to administrators or other users or groups are messy multiple steps process in Windows. There are multiple ways to make grant full control permissions and ownership to administrators easier, such as using Take Control Of command script or manually issue takeown and icacls commands in Command Prompt window. It’s also possible to add a right click menu item to contextual menu that appears when user right clicks on files and folders, that automatically take full control and ownership of the selected files or folders as administrators. In order to add a “Grant Admin Full Control” command to Windows right click menu, just download the following registry registration entries file, and double click on the GrantAdminFullControl.reg to merge new registry keys and values to system. The registry entries have been updated from previous version. It works on both 32-bit (x86) and 64-bit (x64) OS and is non-recursive. Tip: It’s possible to change “Grant Admin Full Control” to any name you like if it’s not to your liking. 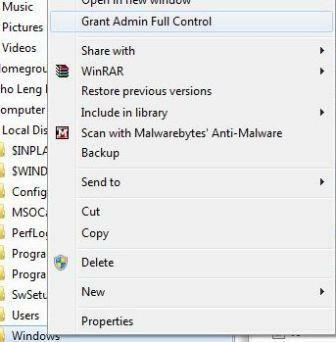 To change the name on the right click menu, just edit the .reg file, and replace the three Grant Admin Full Control string in the text file to your prefer name, such as Take Full Control Permissions, Grant Administrators Full Permissions, Give Administrators Full Control, Grant Administrator Rights and etc.